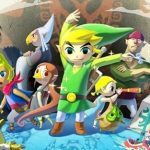 In this five-part article series for The Missing Link, renowned Zelda theorist Hylian Dan discusses The Wind Waker‘s deepest themes and philosophical connections. Read the entire article below. The King of Hyrule speaks these words at the end of The Wind Waker. As he faces his own ending, the king reflects on how he has lived his life. Looking back, the king perceives only yearning and regret. Looking back, he perceives his own foolishness. A traveling merchant says this to Link on an island in the Great Sea. The merchant explains that he has a dream of one day opening his own shop. He set out to pursue this dream long ago, but things did not quite work out. The days went by and plans got delayed, and now thirty years have passed fruitlessly. Time is passing and the merchant lets it slip through his fingers. Life has passed and for too long the King of Hyrule has not lived it. These words are the thesis of The Wind Waker. The entire game is built around this philosophy: live for the future. The game is laced with metaphors and parables that develop this theme and support it with examples. The metaphors—islands and oceans, birds and cages, winds and sails, trees and seeds—illustrate this philosophy while the parables—the storylines that unfold throughout the game—provide context for these metaphors, showing how they may be applied to the way we live our lives. Time slips away all too easily. There are many people who grow old too quickly, who look back and sadly speak the words, “If only…” But there are other ways of living, ways that lead to happier destinations. There are lessons to be learned from Link’s adventure on the Great Sea, for The Wind Waker is a guide to living a fulfilling life. The people here would never even dream of leavin’ their little paradise and settin’ sail on a voyage at sea, know what I mean? Why, this town is full of faces that don’t even show the slightest interest in the sails of a ship. Are we sailors the only ones? Has no one else set out on the Great Sea? One of the most memorable features of The Wind Waker is the design of the game world: small islands and vast oceans. This design does more than simply set up the gameplay and story, however. It conveys a certain way of seeing the world. Sometimes we have solid ground beneath our feet. At other times we are on our own, and nothing but our own resilience is there to keep us afloat. It is true that those who sail the seas face many dangers. But, there is also a danger that threatens those who never set out on the Great Sea: the prospect of an unlived life. What? You worried about little old me, fry? Hah! Don’t be! I’m a man-fish! I’ve spent my life being toughened up by seas rougher than any you’ve ever seen! 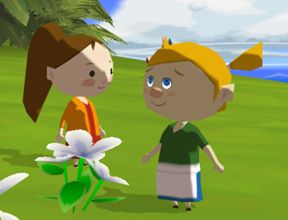 The Wind Waker begins by introducing two of its central characters, one who embodies the lifestyle of an islander and another who embodies the lifestyle of a sailor. Link has spent his entire life thus far on Outset Island, a place of comfort and beauty. His is a life of leisure, with plenty of time for napping. He has a cherished sister, a loving grandmother, and a whole community of friends there to support him. You’re probably wondering why we treat young Miss Tetra with so much respect when she’s clearly so much younger than us, aren’t you, now? I suppose it was just chance that we lost our last Miss when Miss Tetra was still young. Hooo… Fate is cruel, she is. That’s why Miss Tetra took over so young. She owes it to her predecessor. Everyone’s come to respect her for that. For coping with so much, at such an age. Respect has nothing to do with how many years you’ve been on the earth. There was no life of leisure for Tetra. The mother who should have been there to love and support Tetra vanished from the world. But Tetra endured. 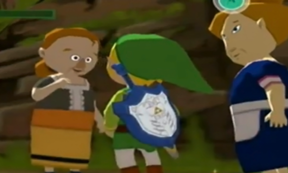 When Tetra meets Link, one of the first things she observes is how this boy handles loss: when Link’s sister is kidnapped, Link is horrified and he abandons his senses. Chasing after the great bird that has Aryll, Link runs straight off a cliff. Get ahold of yourself! She’s gone. There’s nothing you can do. 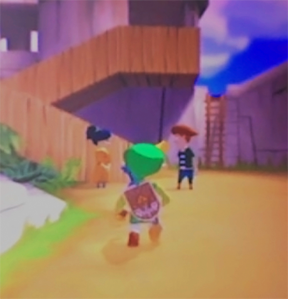 Tetra the sailor already understands hardship and loss, but Link the islander is inexperienced and reckless. Tetra is familiar with hardship, but Link is inexperienced and reckless. As Link recovers some of his wits, he sets a goal for himself: to rescue his sister, no matter what. The local adults warn Link, “Setting out like this means many long hours of toil and hardship lie ahead of you.” But Link goes forth to pursue this goal, even though it means leaving behind his life of leisure. But Link proceeds, and his life as an islander ends. He lets go of paradise and prepares to face the world beyond. This is one of the necessary stages of life, for paradise does not last forever. Living for the future means being willing to let go. Not all of The Wind Waker’s characters are as bold as Link. There are many people who do not take such a step. Instead, they live bound to the life that they have always known. 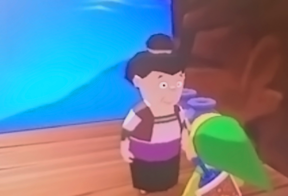 One such person is Missy, an old lady who is a permanent resident of Windfall Island. She spends her days gazing at Dragon Roost Island on the horizon. She’s heard stories of the majestic Rito Tribe that lives there, and she longs to see the place with her own eyes. The sky-dancing Rito tribe… A mystical sky spirit… Dragon Roost Island just sounds like a paradise floating in the ocean of my dreams! But… to someone like me, a person who’s never left this little island, it may as well be a fairy tale out of a child’s book. …Oh, if only I had my own boat! Missy is confined to Windfall Island. Missy has a dream but she does not pursue it, not believing she is able to. As Missy grows old, she thinks of this dream and speaks those words, “If only…” Time is slipping away, but she is confined to her island. 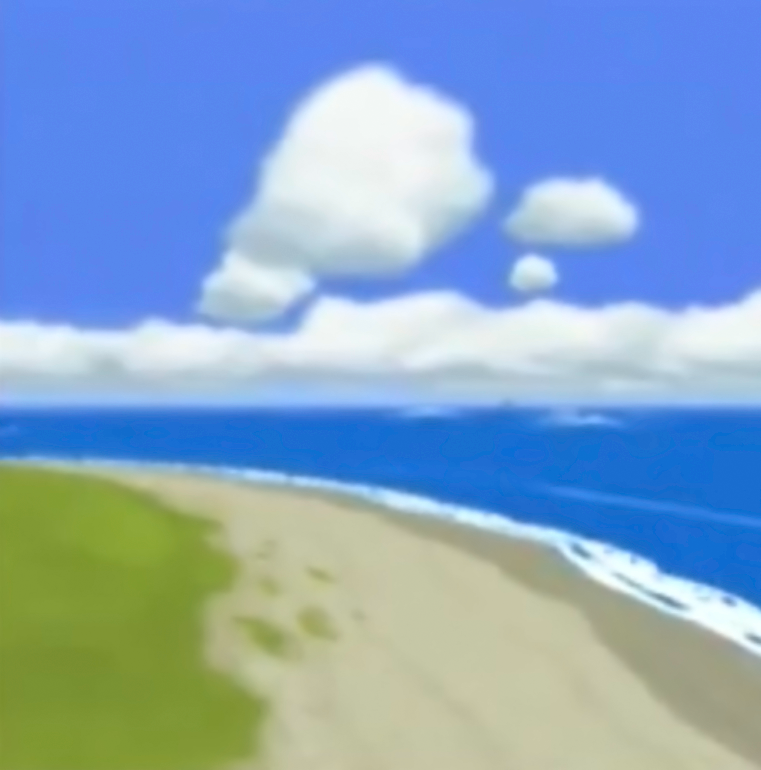 In this way, The Wind Waker presents the metaphor of islands and oceans in literal terms: some people stay on islands and others set sail. However, this metaphor extends beyond such literal expression. Somewhere in town is a couple, a man and woman whose hearts are secretly filled with thoughts of the other, and yet for reasons unknown, the two have never spoken. I cannot let this tragedy go on any longer! They suppress the longing in their hearts; Lenzo dramatically calls this act a tragedy. Time marches forward as Anton and Linda stand in place, bound to their comfort zones. Anton and Linda gaze at each other, and then walk away. Fortunately, Lenzo intervenes and pulls some strings, with Link’s help. Anton finally decides to ask Linda out on a date. …So what’s her name, anyway? Do you think she’s nice? Does she have a steady fellow? Ohhhhh, I’m so NERVOUS! Such is the feeling of taking a chance. But in spite of the fear, Anton speaks with Linda and things go well for him. Hey! It’s you! Listen to this, will you? I…DID…IT! I worked up my courage, and I talked to her, and it was totally the right move! You know why, buddy? She likes me! Lenzo is able to perceive that there is a better life waiting for Anton and Linda, if they can just muster the nerve to pursue it. Nevertheless, there are others who do not feel any need to step past their limited comfort areas. They are happy with life the way it is, and they do not want it to change. Minenco was dubbed Miss Windfall forty years ago, and she relishes that status every day. She refuses to believe that her physical beauty will ever fade. My skin will always be beautiful! Hoo hoo hoo! Not even the younger girls look prettier than me! There is also Manny, a fan boy who is content to wander the Nintendo Gallery in awe. The Nintendo Gallery is a series of rooms that Link and a sculptor named Carlov gradually fill with figurines. Listen… Please try not to interrupt me as I gaze upon my figurines…in supreme bliss. All I want out of life is just the chance to hang out and gaze at my figurines… My life is soooo good. The allegorical content here is thinly veiled. Manny is happy to live life in a bubble, a world of hand-made figurines in place of real people. It is a world not unlike the Zelda universe: an artificial escape from reality. Manny wants to stay in this paradise forever. However, there are consequences to living such a blissful, unchanging lifestyle. The Wind Waker uses several characters to illustrate these consequences. On Windfall, there are two girls who have earned the nickname “The Little Tipsters” thanks to their habit of spreading rumors about the island. There happen to be two middle-aged women, Pompie and Vera, who are also eagerly exchanging idle gossip. When Link eavesdrops on their conversation, they become upset. …She is so saucy, isn’t she! I can’t believe she’s a schoolteacher! Hm? …Now, just WHAT are you doing? Were you listening to us, you scamp? We’re discussing…very, VERY important topics that kids just wouldn’t understand. You’re far too young to be listening to us, young man! So shoo! Pompie and Vera fuss about the fact that Link is a child, but their own lack of maturity is quite apparent. They come across as older counterparts of the Little Tipsters, alike in both appearance and behavior. Pompie and Vera have simply spent a longer amount of time doing what the Little Tipsters are doing. That is what becomes of people who live unchanging lives. They grow old, but they do not grow. The Wind Waker takes this important point even further. On the Private Oasis, a nasty butler guards the cabana of Miss Marie the schoolteacher. The butler serves two purposes: he scowls and barks at any stranger who comes close, and he welcomes the owner of the cabana whenever he or she visits. When the master or mistress is present, the butler’s demeanor changes abruptly and he becomes as polite and subservient as is humanly possible. But there is a catch: the butler is not quite human. Ah! All of a sudden, I have become painfully aware of my existence as a door. The butler plays the role of a door. The butler’s two purposes are that of a door: to chase people away and to welcome them. The butler has spent so much of his life simply playing this role that the game depicts him in the physical form of a door. This is the danger that paradise poses. One who remains on an island for too long risks becoming as immovable as the island itself. The energy of life drains away with time, leaving only an inanimate object. Link is thrown into a prison cell. 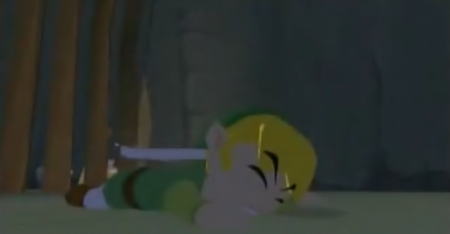 As Link storms the Forsaken Fortress early in The Wind Waker, he gets thrown into a prison cell if the guards spot him. Tetra rebukes Link if he spends too much time lounging around in the cage. Are you planning on spending the rest of your life in there?! Look around! I’d be surprised if a run-down cell like that didn’t have a hole or two that you could use to worm your way out! Surely enough there is a crack in the wall hidden behind a vase. Link wriggles through the crevice and escapes to freedom. Tetra’s question, “Are you planning on spending the rest of your life in there? !” connects Link’s behavior to the behavior of the permanent islanders. Islands are small, confined places – and so is Link’s prison cell. Islands tempt people with their beauty, with their safe familiarity, with the easy life that they promise. But beneath the illusion of paradise, there is a cage. Paradises are places of beauty, but those who live in paradise must be able to let go of it lest it become a prison cell. It is a shame to spend all one’s time in a small, confined space when there is a great wide world out there, waiting to be experienced. Ahh, do you not feel the grand romance of the wide open skies? The roaring invitation of the wind? The soft call of the clouds? You are a boring, boring creature. Whenever Link sets out for the Great Sea, the island he had just visited shrinks into a tiny speck behind him. The Legend of Zelda theme song begins playing as the wide ocean stretches out in every direction. The little paradises fade away as new shadows appear on the horizon, gradually taking shape as Link sails towards them. A life of adventure awaits those with the courage to step beyond their comfort zones. Dan Merrill, aka Hylian Dan, attends Champlain College in Burlington, Vermont, where he is majoring in electronic game design. His portfolio can be found at www.danvmerrill.com. 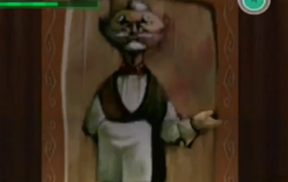 Old Man’s identity revealed: It’s Aonuma!